On August 19th, 1993, the collectible card game Magic: the Gathering was introduced at longstanding gaming festival Gen Con in Geneva, Wisconsin. In that one weekend, the convention’s attendees bought out its entire stock for the rest of the year. Over the next 25 years, both properties grew immensely, but they also grew apart. Despite the continued presence of other Wizards of the Coast products, Magic has hardly been seen at Gen Con for the last few years. However, in August of 2018, on Magic’s 25th anniversary, the two seem to have made up. Magic, now the world’s most played trading card game, was one of the largest single presences at Gen Con, now North America’s largest tabletop gaming convention. Between official panels, vendors, cosplayers, and gaming events of all shapes and sizes, no one in attendance could possibly miss the collectible game juggernaut. 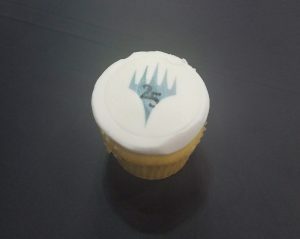 Moreso, being Magic’s birthday, Wizards of the Coast was prepared to celebrate appropriately. The birthday logo was plastered everywhere. Panels were hosted to laud the history of the game, from the business to the lore to the art. Draft events from some of Magic’s most beloved sets were firing throughout the weekend. There were even birthday cupcakes! The focus of the celebration, though, was the series of birthday qualifier tournaments. These limited format events, eight in all, looked for one winner each to invite to a truly historic event: a Rochester-style draft of Magic’s second ever set, Limited Edition Beta. The qualifiers were all packed, most of them even filling to capacity. Some events started started mid-evening and didn’t end until the wee hours of the morning. Many players signed up for multiple qualifiers in the hopes of participating in this once-in-a-lifetime event. Competition was understandably fierce, but spirits were still high, with laughing, handshakes, and good will going all around. The Beta draft itself, held Sunday morning (“in a secret location”, the head judge announced), was unlike anything seen in modern Magic. The Rochester-style draft meant both the players and spectators, via Twitch Stream, were able to see every card as it was opened. Basic lands, the primary resource in gameplay, sometimes occupied more than half of the 15 card packs’ contents. Though newer basic lands are free to any modern player, even these were happily picked for their collectability. A cheer went up in the crowd when a card worth hundreds or even thousands of dollars was revealed, which happened eight or nine times during the event. Despite the high stakes, the drafters were all clearly smiling and having a good time. After completing the draft and building their decks, the players returned to the main hall and sat in a roped off area to play their games in a single-elimination bracket. Seeing Magic being played as the creators intended, using some of the first cards ever developed, was a sight to behold. Retired mechanics (such as Banding) were present, requiring extensive rules knowledge to play optimally. The emphasized play styles were entirely different, with mediocre (at best) creatures alongside powerful spells. “Fast mana” and a multitude of cards meant to “hate out” specific colors were played, both ideas WotC R&D had abandoned years ago. Additionally, the rules of the game have changed so much over the intervening 24 years that many of the cards don’t actually work as printed anymore. Some aspects, however, were still remarkably similar. Lightning Bolt and Swords to Plowshares, for instance, are still staples of competitive Magic, while Juggernaut and Icy Manipulator were printed as recently as Magic’s second most recent set. In the end, Aaron Forsythe, Senior Design Director for Magic, took to the stage to announce the winner. 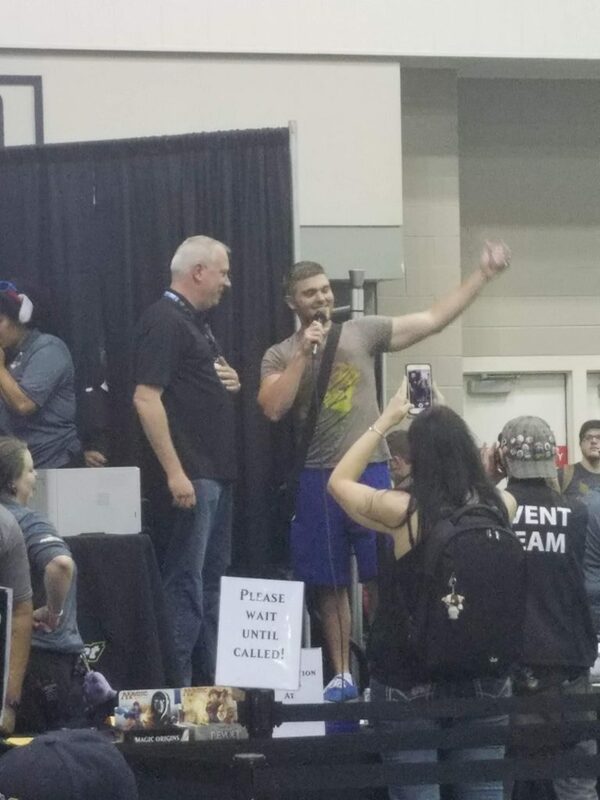 The young man gave a very short thank you to Wizards and to Gen Con, and then he accepted his prize of $2500 and a sealed started pack from Alpha, the same type that were sold at that Gen Con 25 years ago. The Beta draft was the highlight of Magic’s involvement at Gen Con, but it was by no means the only event going on. Competitive events of all formats were held regularly, from Legacy to Pauper to the most recent set draft. There was even a qualifying event for invites to Eternal Weekend, the game’s largest annual event for the Legacy and Vintage formats. Casual events fired constantly, including Commander games, chaos drafts with packs from across the last 10 years of Magic, and single-match Standard events. One event of particular note was the Grand Melee, which was a single 24-person game played with decks constructed from booster packs of Unstable, Magic’s latest “joke” set full of wacky cards and unpredictable effects. Multiple people played at once, cards were thrown across the table, games of Hangman were played, and many, many high-fives were shared. Attendees who didn’t play magic weren’t ignored, either. Just outside the main gaming hall on a busy concourse, WotC had set up a “learn to play” booth. The instructors manning the booth were always excited, giving overviews of the rules peppered with stories of dueling wizards summoning monsters to fight for them and casting mighty spells at each other. There was always a crowd at the booth, but everyone who was interested walked away with a free Welcome Deck or two to practice with. Those who were willing to wait a few minutes got to play these decks against each other under the direct tutelage of Magic judges. As awesome as the whole event was for Magic and those who play it, there were still definitely things to be improved upon. Most obviously, WotC demonstrated their inability to properly schedule their events again this weekend. 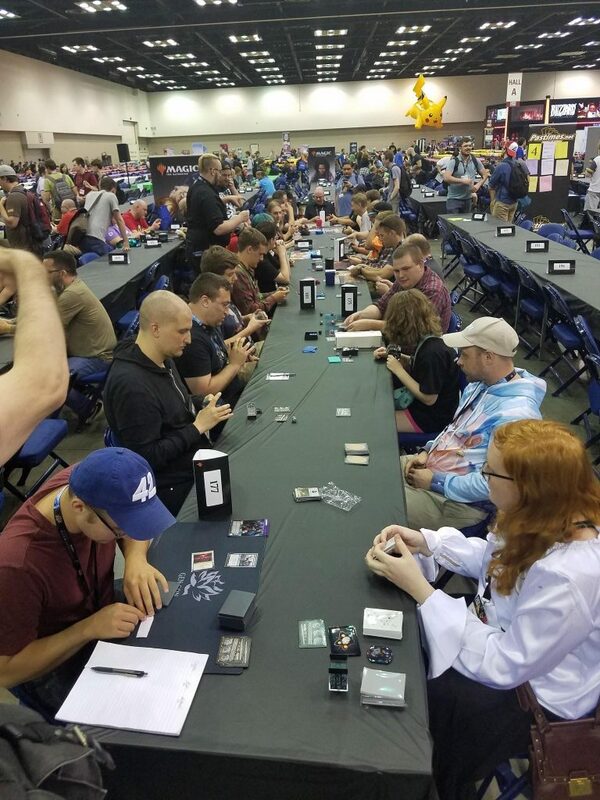 Pro Tour 25th Anniversary was going on exactly during Gen Con, splitting the attention of many of the game’s fans. This Pro Tour, especially, was a celebration of the Magic’s history and was the first team Pro Tour since 2006. The Silver Showcase, a special invite-only event meant as a promotion of the game and a further birthday celebration, also happened during the convention. 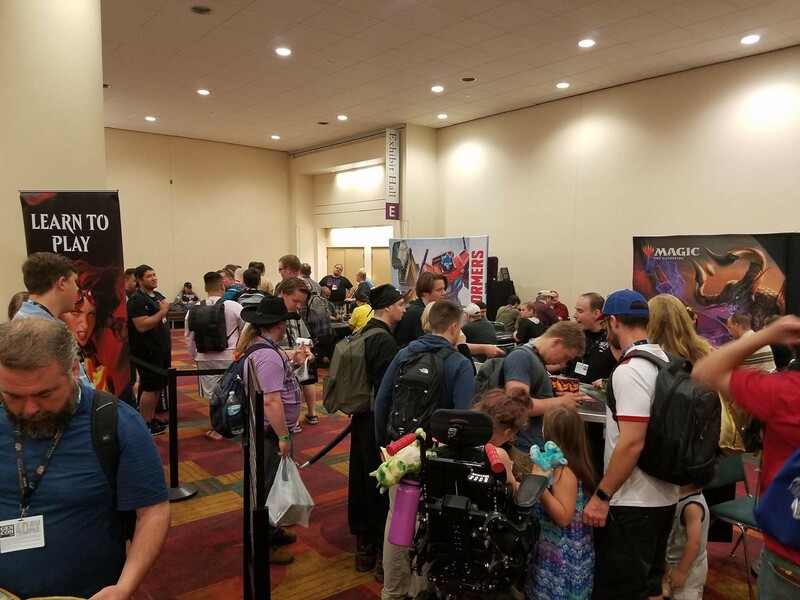 Wizards of the Coast may not have control over Gen Con scheduling, but they should be able to work together with (or at least work around) Gen Con to make sure the most people possible get to experience as much of their game as possible. Another concern was the complete lack of Arena, Magic’s latest venture into the digital realm. Looking around both the gaming and vendor halls, other digital games, especially Hearthstone, were able to have a presence and provide demos and play areas. While it is true that Arena is still in closed beta, this hasn’t prevented WotC from providing demos of the game at previous public events such as Magic Grands Prix. The game in its current state is quite polished, and the beta is barely closed at all with the number of codes given out recently. It seems odd that WotC wouldn’t use the country’s largest gaming convention to push their new product, especially considering it is currently scheduled for full release near the end of 2018. These concerns, however, are for Magic’s continued growth. It was clear from everything that went on over the weekend that it is going as strong as ever, and the community came out in support of this. In the end, Gen Con was an amazing event for the game and for its players. 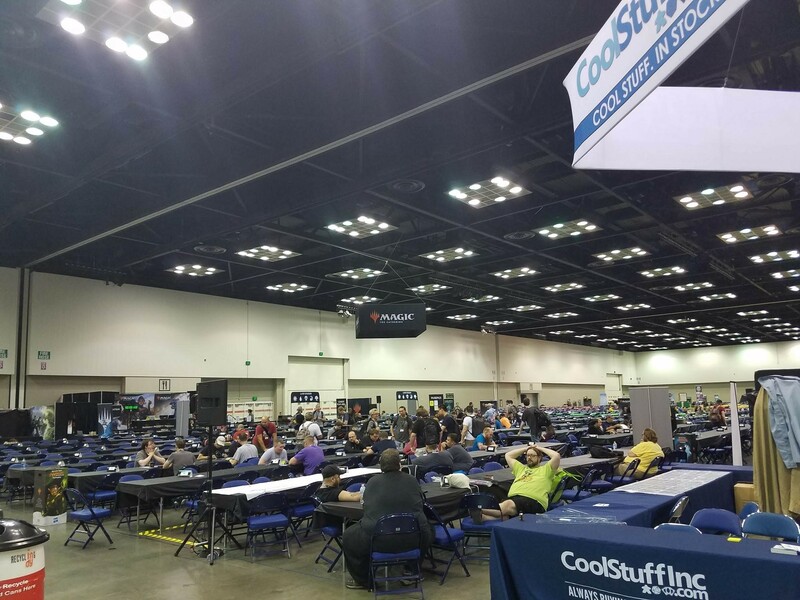 The Magic community got to experience their game in context of hundreds of others, and those games’ fans got a chance to experience Magic. It was a celebration worthy of a 25th birthday, and we can only hope that the 26th will find Magic and Gen Con still working so closely together.